A reported $182 million settlement between New Jersey Transit and Amtrak to cover the use and upkeep of certain rail lines is “paving the way” for future infrastructure investments aimed at improving safety and the “customer experience” of the traveling public. “The announcement today establishes a partnership that will achieve these goals now and lays the financial foundation for continued improvements into the future,” noted New Jersey Gov. Phil Murphy (D) in a press conference on Feb. 13. 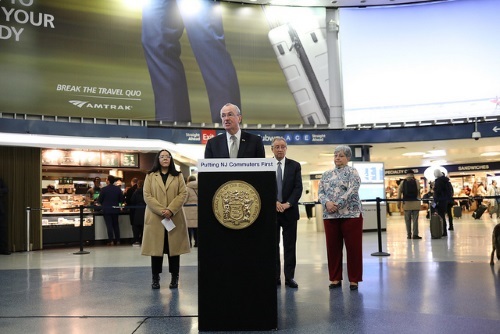 The settlement covers “back payments” comprised of $44.5 million in operating costs and $137.5 million in capital contributions, according to figures released by NJ Transit, from when former New Jersey Gov. Chris Christie (R) suspended monthly rail line usage/maintenance fees from March 2017 to June 2018 due to several derailments. Going forward, Kevin Corbett, NJ Transit’s executive director, said his agency will pay Amtrak approximately $7 million per month for the use and maintenance of its rail lines – a fee laid out in the 2008 Passenger Rail Investment and Improvement Act. “This agreement represents a clean slate and a new era in our relationship with Amtrak,” Corbett noted during the press conference. Amtrak and NJ Transit also jointly agreed to reinvest all of the funds that comes from this and other agreements into existing and future joint Northeast Corridor infrastructure projects that benefit both of them, as well as the safety and travel experience of their customers. That includes the Portal Bridge, as both organizations also highlighted that they are ready to begin full construction on Portal North as soon as federal funding is secured, they said.